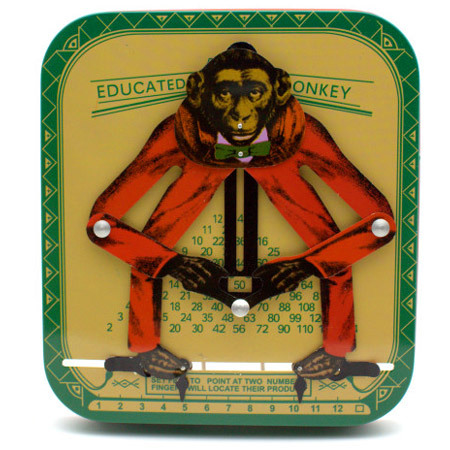 Tin Toy Educated Monkey Calculator is a wonderful tin calculator that is entirely mechanical. Invented almost a century ago it was first made in the USA by William Robertson. At the time the toy was considered an educational aid as well as a novelty item. People find this toy fascinating and are disarmed by its beautiful simplicity. Just move the monkeys feet to the numbers you want to multiply and the answer appears between his hands. It also has a little fold out stand. Material / Mechanism: Tin / Worked by hand. Age: 8+ Small sharp parts. We like this because: "so simple! It can even do the square of a number"
Hi Douglas,Thanks so much for the prompt arrival of our gorgeous wooden toys.The doll house furniture is really remarkable quality for the price. We wanted something pretty simple for our daughters first furniture and we will certainly be looking at your website again when we are ready to upgrade to something more upmarket.Thanks again.